A PEO, or Professional Employer Organization, handles the outsourced HR functions for a business through a co-employment relationship where the business becomes the worksite employer with certain roles and obligations, and the PEO becomes the employer of record related to functions such as W2s. The PEO and the client company enter into a contract where certain duties related to payroll, taxes, benefits, and/or human resources are going to be administered by the PEO. The employees retain their current worksite supervisor, policies unique to their workplace, and perform their daily functions as they would with or without the PEO. Oftentimes the only time they think of the PEO is when they review their paystubs or need a verification of employment for a loan. Co-employment is a contractual business relationship where the client company is the worksite employer and the PEO is the employer of record for administrative purposes. This means that the client company, as the worksite employer, sets important worksite direction and business decision-making, like allocating the work to be performed, setting hours of work and maintaining control of the work environment. The PEO serves as employer of record related to administrative functions like payroll and benefits administration. If I use a PEO, do they have to process my payroll? Yes, in a PEO relationship, the payroll is processed by the PEO. This allows the PEO to seamlessly offer the suite of benefits related to insurance, risk management, etc., while having the appropriate payroll-related records that are important to those functions. Companies all over the world, in almost every industry, can use a PEO. It is a functional outsourcing relationship, similar to outsourcing your accounting or other non-essential functions, to allow the business to focus on its core operations. What all is included with a PEO’s services? Depending on which PEO you use, service offerings may differ. For FullStack, services include payroll processing, tax remittance, benefits administration, worker’s compensation administration, unemployment administration, and HR administrative support - which includes forms and templates, as well as advice and consultation on employment-related matters. The PEO pays relevant taxes and wages on the given frequency decided; however, it is the client company’s responsibility to make the funds available to the PEO on a timely basis to pay for the costs as part of the contractual relationship. The worksite employer (client) is responsible for providing a safe work environment that is compliant with all relevant rules, laws, and regulations. The PEO is responsible for complying with relevant laws related to the outsourced HR functions, and to help provide guidance to the worksite employer for best practices. The bigger question is, why shouldn’t a company outsource? Companies need to be able to focus on their core functions, and outsourcing frees up valuable time and resources to spend on those core functions. Partner with experts in those industries a company does not know in order to leverage talent and business capabilities. You need to focus on growing your business. We can focus on compliance, taxes, and tactical HR needs. 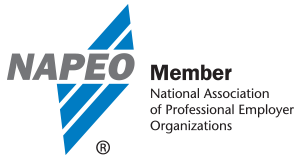 Is there a national organization for PEOs?